Valid Photographic ID is required upon entry to verify your ticket. Suitable forms of valid photographic ID include your passport, driver’s licence and any photographic ID that carries the PASS logo. Photocopies are not acceptable. 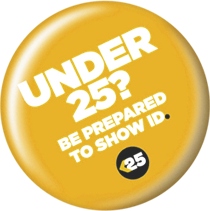 For those lucky to look younger than 25, in accordance with our Challenge 25 policy, our bar staff will also be required to check ID at point of sale, so please take this as a compliment as there are those of us who miss being asked. Thank you for your understanding and we hope you enjoy Oktoberfest responsibly.